Perfect for taking your project anywhere you want to work on it. Work at your bench, your office desk, the dining room table, in the living room in front of the TV ... wherever you like, your project moves with you. No setup time, just get right back to work. Also great for getting a project off your bench to make room for another, store your entire project on it's Painting Station on a shelf until you are ready to go back to it again. 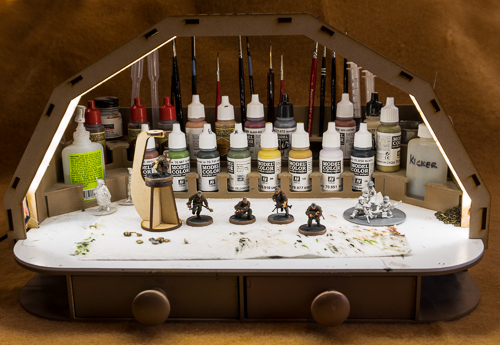 Painting Station sizes are measured in millimeters, these dimensions refer to the maximum paint bottle diameter that will fit in the painting station. Made from 1/8" (3mm) precision laser cut MDF. MDF is a wood material that is very easy to work with and extremely durable. Any adhesive that you would use with wood will work fine with MDF, for example Elmers Wood Glue.